In spite of the fact MOTORHEAD is the primary influence for about 90% of the extreme bands in the world today, it is only once in a very great while that I come across a band whose sound pays proper homage to Lemmy and company. BOULDER is one of those elite bands. In fact, BOULDER may be the best of those bands. They take all the rumble and roar of the mighty 'HEAD and infuse it with a subterranean uncivility that brings to mind the noisy ruckus of neo-greats like EYEHATEGOD. 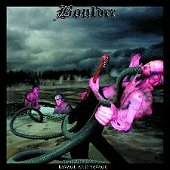 You stick in "Ravage And Savage" and you aren't merely listening to BOULDER, you are experiencing them. BOULDER chose a great name for their band because the throbbing bass, barbaric drums and vibrating guitar riffs sound not dissimilar to an avalanche of stone. You only have two choices... get out of the way or get crushed. I choose the latter.